I was introduced to Pf Caroline Dyer through a previous client, Pf Cristina Leston-Bandeira, also from the University of Leeds. We collaborated with Cristina in June this year and, following from that, she introduced us to Caroline. 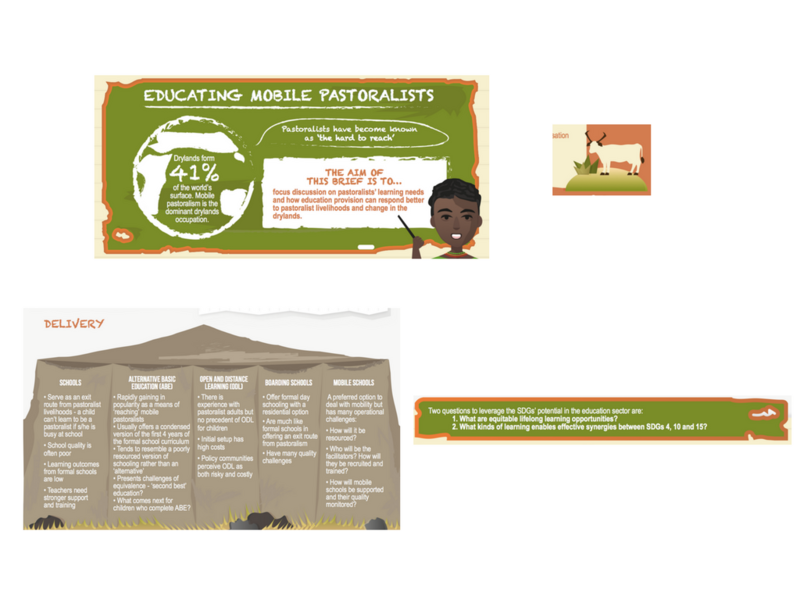 When Caroline and I connected we agreed to create a 2-page visual summary based on Caroline’s research, the topic of which was education and pastoralist populations. At the time, the forum where the summary would be presented was yet to be decided. I told Caroline that most of our clients have an event in mind when they work with us, either a conference, a workshop or a policy seminar. Caroline then immediately thought of an upcoming conference she’d be attending in November of 2017 in Dakar, Senegal: “Pastoralism in the current of global changes: stakes, challenges and prospects”. The first stage of our collaboration was the consultation process. I met Caroline in her office and discussed the research, the problem it is addressing, the current gaps in knowledge and how this brief could help stir the debate in a proactive policy direction. After meeting Caroline, it was my turn to flesh out the text structure we agreed on. To do this, I revisited the material Caroline had sent me, namely a PowerPoint presentation she had delivered and a report on the topic. 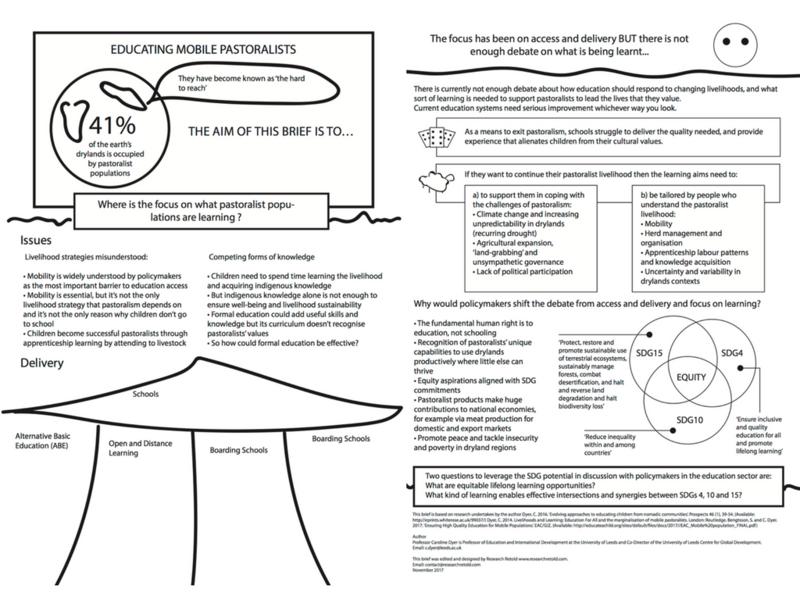 I synthesised the research material and produced a 2-page text summary that would be the basis of the visual brief. The aim at this stage was to create a draft and then work with Caroline to tweak it and refine it. After 2 revisions, we agreed on the final text for the summary. At this stage we erred on the side of less text (despite Caroline’s initial concern that we may be saying too little!) because during the design stage there needs to be breathing room and space for the text to flow. Once we agreed on a final version of the text, it was time to bring in my creative partner, Radina, to brainstorm ideas on how this research summary could be brought to life. Out of all the stages in the process this is my favourite one because it is when magic truly happens: ideas that are expressed in a black and white format are visualised and designed in a way that draws the reader in. We met in a local coffee shop, and armed with pens and paper, we talked about the overarching theme of the project, which was education, and started drawing related elements that could help highlight the key sections of the text. A key part of the design process for us was ensuring that the icons were authentic and relatable to the audience. 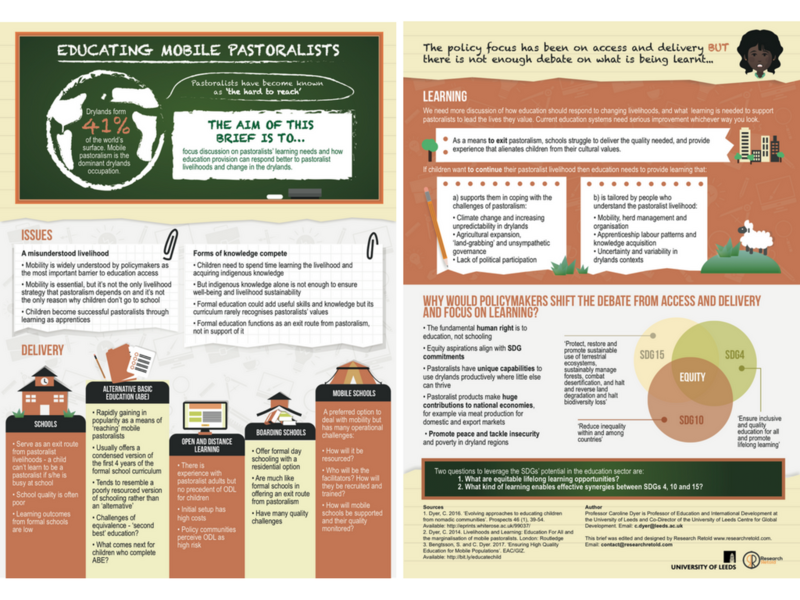 This was a challenging aspect because there is no place online to get inspiration about ‘authentic pastoralist education elements’. After receiving Caroline’s input, we created a first draft of the brief. The overall feedback from Caroline was positive, but it was clear that a few elements had to be tweaked. The most important feedback related to the authenticity of the icons and design elements. 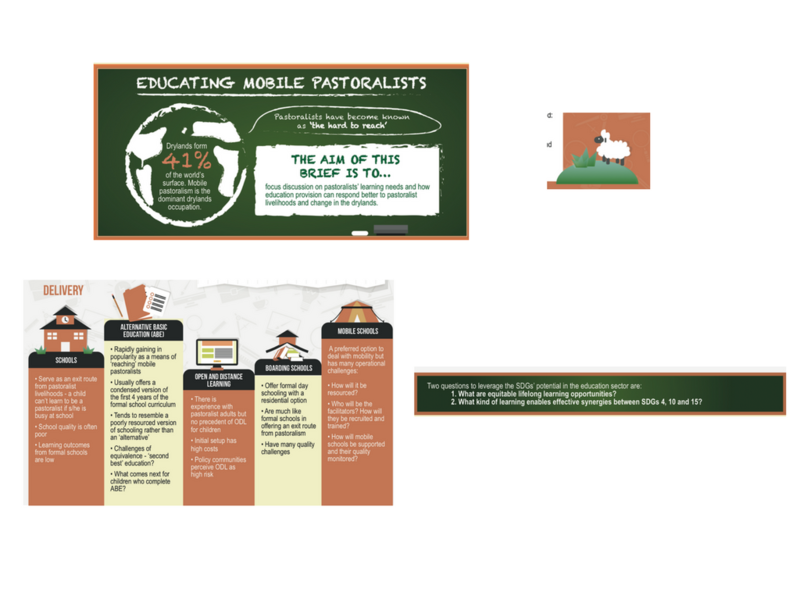 The main concern here was that the icons related too much to Western ideas of education (i.e. laptops, clean books, full and sharp pencils, nicely built buildings), when in fact pastoralist populations learn in tents, made out of shabby tarpaulin, they use stubs of pencils without rubber at the end and their blackboards are dusty and in bad condition. It was imperative that we addressed these authenticity concerns as well as bring in more genuine elements such as the long-horned cow, the dry grass and icons that were representative of pastoralist children in these settings. A few colour changes were also needed as the dark green of the board was too intense and looked out of line with the other colours. 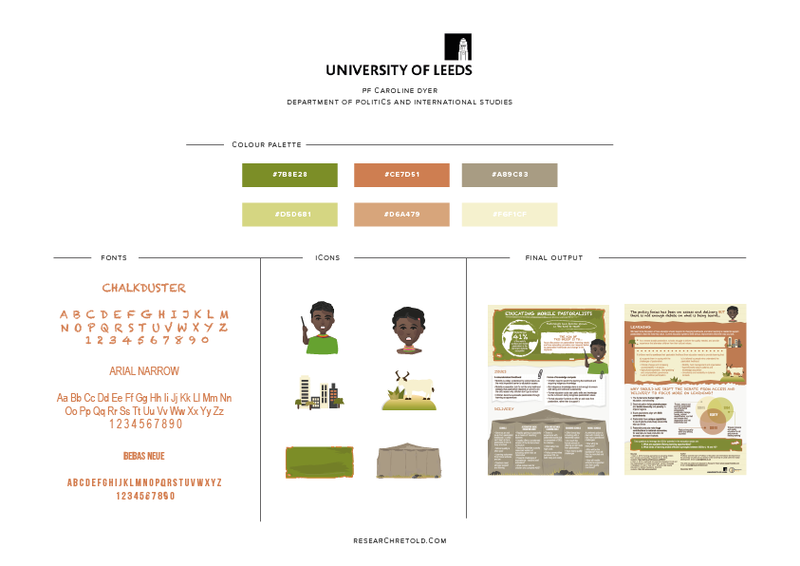 The second version of the visual summary underwent two more revisions in terms of text changes. A few modifications were made to improve the clarity of text and say goodbye to any widows and orphans. Again, the focus was to improve the flow and tweak the wording to ensure it’s as clear as possible. During this stage, the document was printed and read by several colleagues to catch any typos. Finally, the citations were formatted using APA style and we double checked the links were fully working. For the last stage of the process, we extracted the visual elements of the brief and compiled a folder of visual elements that Caroline can use on social media or to insert in blog posts. 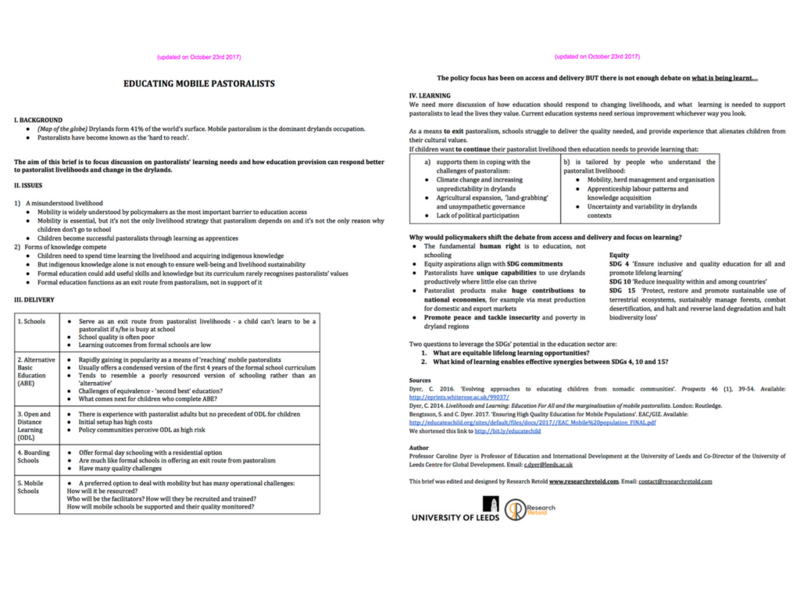 In terms of final formats, the document was exported in two versions, one suitable for website upload and one for print. As always, we advise that printing take place on a matte and thicker paper to maximise the visual impact the brief will have. 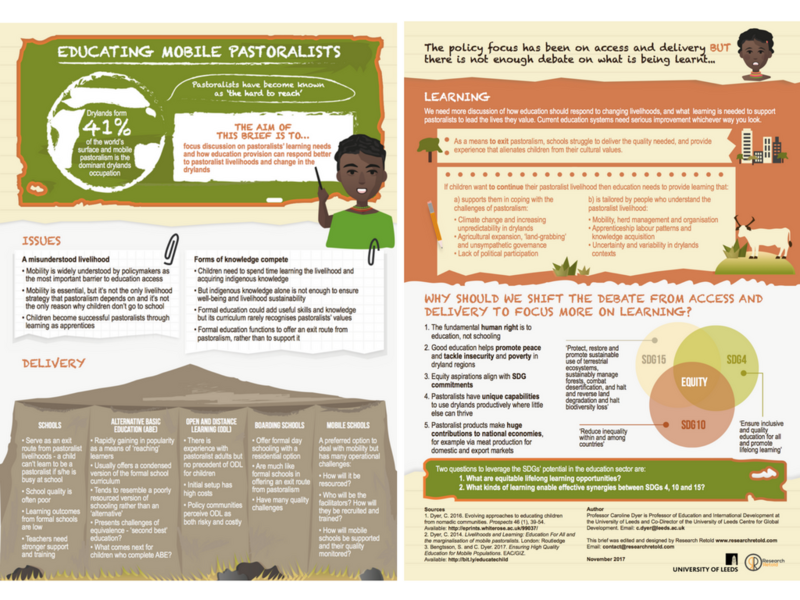 We’re thrilled with how this new research summary turned out and we loved working with Caroline. We would love to hear your thoughts on it, too!